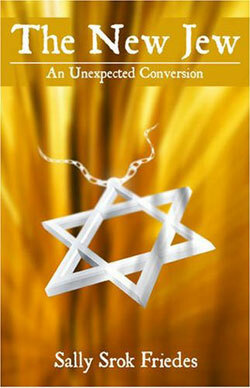 Review of The New Jew: An Unexpected Conversion by Sally Srok Friedes (New York: O Books, 2009). Every conversion is different but there are issues that remain constant in every convert’s story. Prospective converts will often talk about having had a crisis of faith, feeling a disconnect from religion in general or from the religion of their birth. This eventually turns into a hunger to fill that void. Though many Jews seem to believe otherwise, most converts to Judaism do not convert for marriage. At odds with the idea that no one converts to Judaism out of conviction are stories like that of Sally Srok Friedes who married a Jew but didn’t decide to convert until long after the wedding. The New Jew, the latest conversion memoir, is not just the story of how Sally, a Catholic from the Midwest, finds her way to Judaism, it’s a love story. Not with her New York Jewish husband, but with the religion her husband tells her after proposing he hopes they will pass on to their children. “Is that a problem?” he asks. Aside from Passover and the High Holidays, he has never expressed much of a connection to this religion. Sally is surprised but she agrees, neither she nor her husband fully understanding where this decision will take them. Judaism does not proselytize. People of other faiths need not convert to go to heaven or be “saved” as Christians call it. Because of this, Judaism’s relationship to prospective converts is complicated. People warn converts they are supposed to be turned away three times. They even take it upon themselves to turn people away. Nobody clues Sally in to these mysteries as she tries again and again, against all reason, to connect with a faith that doesn’t want her. Hers is an unrequited love. When Sally shows up for her first Judaism classes and for her first Jewish services, she finds herself surrounded by Jews like her husband who don’t know much about Judaism. She discovers that while they are welcome even with their lack of knowledge, she is not. She is told time and time again, though surprisingly not by her mother-in-law, that shiksas (derogatory Yiddish term for women who are not Jewish) like her are a harbinger of doom, the end of Judaism. Early on, Sally finds Judaism is a very exclusive club, determined to shut out non-members. For a time, Sally turns her back on Judaism. She is no masochist. The religion doesn’t captivate her, especially since most of her friends are unable to explain why they feel so connected to a religion they know nothing about. Her book is disheartening as it highlights a sad symptom of American Jewry, the total lack of knowledge about their religious roots. Sally learns quickly that for many Judaism is not a religion but a “culture” and while this is enough for some like her husband, she discovers that it isn’t enough for her. As other converts have written of their experiences, the more Sally learns about Judaism, the more she loves it. We revel as she takes on more and more, insisting on Shabbat dinners (“Next thing you’re going to want to keep kosher!” her husband rails), reading through Jewish books, stumbling through Hebrew and feeling totally overwhelmed by services that are utterly foreign to her. Reading through these tales as a fellow convert was touching. It brought me back to a time when Judaism was still shiny and new, when I would devour books on Judaism as if they were Godiva chocolate. This thirst dulls after conversion but it is never quenched. There is always more to learn about Judaism. When an overwhelmed Sally second-guesses her decision to convert, worried she will never be accepted as a member of the tribe, I was flummoxed. This was very different from my experiences. I’d never experienced doubts. Once I had tasted a little bit of Judaism, a little honey drizzling over challah, there was no turning back. One concern I had, one other Orthodox converts have relayed to me, was of dying in a freak accident before converting and not having a proper Jewish burial. It is in describing her moments of doubt that Sally seemed to me most honorable. She notes that the Reform movement did not require her to convert. Choosing Judaism was not a rite of passage she had to adopt in order to raise her children Jewish. Like others in her congregation, she could choose to be a gentile mom raising Jewish kids. But what started as a journey to raise Jewish children turns into a gift … to Sally herself. It is the end, the reward, of a long road of soul searching. The writing is always warm and pleasant, mostly light and never too effusive though it opens with a sad chapter focusing on the death of her mother-in-law. In this love story between a woman and Judaism, the mother-in-law plays the role of Cupid. When her son marries a Catholic woman, she doesn’t sit shiva or express regrets. Instead she rather amusingly recruits her new daughter-in-law to work for the National Council of Jewish Women. It is this early acceptance by her mother-in-law, not by rabbis, that draws Sally closer and closer to Judaism. In the end, this warmth expressed by her mother-in-law and her Jewish friends, far outweigh the other negative experiences Sally has in the Jewish community. But the negative experiences Sally has in the Jewish community are poignant and painful to read because they illuminate how inclusive and forbidding Judaism can seem, at first glance, to outsiders. Perhaps, what Sally’s story does best is highlight that however much the Jewish community has to teach, it has much to learn.